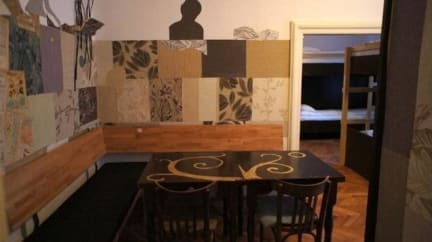 PanGeea Hostel i Sibiu, Romania: Bestill nå! 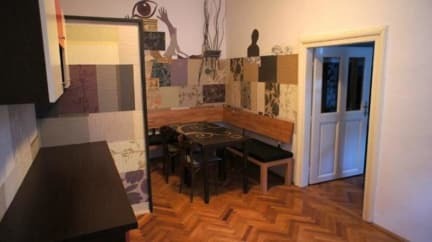 Weather you like theatre, museums, architecture, film festivals, traditional folklore art, or just enjoy the buzzing night life, Pangeea Hostel is within walking distance of most of Sibiu's attractions. Enjoy a hot cup of coffee in the Geea Cafe or have a pint of good beer or just wander around the medieval old town. We have two apartments (one with an 8 bed bedroom, the other with a 6 bed bedroom and a 3 bed bedroom) each with their own kitchen and bathroom, cooking stove, fridge, micro wave, washing machine and dryer. Free wireless internet and big screen tv in our cafe (Geea Cafe) located in the same building. 24 hour round check in, English speaking polite staff.